Response: We performed this study because of concerns about the potential association between fluoroquinolones and aortic aneurysms and dissection raised in two large clinical studies. This concern was noted by the US Food and Drug Administration in May 2016, but the evidence was not deemed sufficient to warrant a warning. Hence, there was a clear need for additional studies to evaluate the problem. Our study was designed to determine whether there is biological evidence that ciprofloxacin—the most commonly prescribed fluoroquinolone—exacerbates aortic disease in a well-established mouse model. The model uses high-fat diet and angiotensin II infusion to stress the aorta and cause aneurysm and dissection. Using this model, we compared mice that received ciprofloxacin to control mice that received only vehicle, and we found that mice that received ciprofloxacin had significant increases in the incidence of aortic dilatation, severe aortic aneurysm and dissection, and aortic rupture and premature death. Importantly, these findings were consistent in male and female mice. Further, we investigated the potential underlying mechanisms and found that the aortas from mice that received ciprofloxacin had decreased levels of lysyl oxidase, increased levels of matrix metalloproteinases, and increased levels of apoptosis and necroptosis. Response: Our study strongly supports the concerns raised by the clinical studies and provides biologic evidence that ciprofloxacin significantly exacerbates the severity of aortic destruction in mice with aortic disease and increases the risk of fatal rupture. We believe the combination of the existing clinical studies and the new biologic evidence warrants consideration of a formal warning against using the drug in patients who have aortic dilatation or who are at risk for aneurysm or dissection. Importantly, on October 1, the European Medicines Agency released their recommendations calling for formal warnings related to this concern (https://www.ema.europa.eu/documents/prac-recommendation/prac-recommendations-signals-adopted-3-6-september-2018-prac-meeting_en-0.pdf). Response: It will certainly be helpful to have additional clinical studies confirming the association between fluoroquinolones and aortic aneurysm and dissection in various patient populations. From a basic and translational science standpoint, it would be useful to study the effects of fluoroquinolones in other animal models of aortic disease. We are currently studying the effect of ciprofloxacin in a mouse model of Marfan syndrome, a heritable condition that causes severe aortic problems. It would also be valuable to test the effects of other fluoroquinolones in such models. 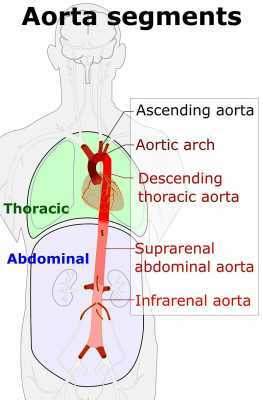 Finally, to help determine what level of exposure is necessary to cause aortic damage, it would be useful to perform experiments to determine the time- and dose-dependent effects of fluoroquinolones on the aorta. This study was supported by the Roderick D. MacDonald Research Fund at Baylor St Luke’s Medical Center and the National Institutes of Health. Dr. LeMaire’s work is supported in part by the Jimmy and Roberta Howell Professorship in Cardiovascular Surgery at Baylor College of Medicine. I have no relevant disclosures related to this work. This entry was posted in Author Interviews, Baylor College of Medicine Houston, JAMA, Surgical Research and tagged antibiotics, aorta, aortic aneurysm, bcmhouston, JAMASurgery by Marie Benz MD FAAD. Bookmark the permalink.